Preheat oven to 425 degrees f. and adjust oven rack to the middle position. Line a large baking sheet with parchment paper. In the work bowl of a food processor, add flour, cornstarch, brown sugar, baking powder, baking soda and salt. Pulse a couple of times to combine. Scatter the chilled butter and shortening over the top of the flour. Pulse a few times, until the mixture resembles coarse meal. In a large bowl add the mashed acorn squash and cider vinegar, mix well. Stir in the Gruyere and sage. Add the flour/butter mixture, stir to combine. Turn the biscuit dough out onto a lightly floured surface, knead a few times to bring the dough together. Pat the dough into a round that is about 1-inch thick. 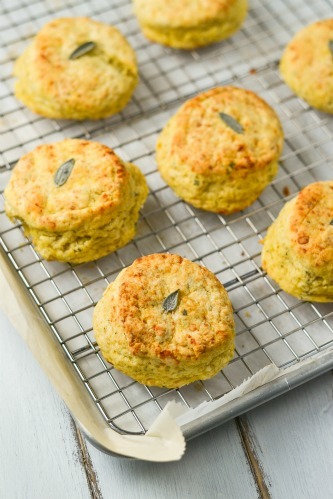 Cut out the biscuits using a 2 1/4-inch biscuit cutter, dipping the cutter in flour to prevent sticking. Gather the scraps continue to cut the biscuits. Place the biscuits, evenly spaced on the prepared baking sheet. If garnishing with the sage leaves. Dip your finger in the beaten egg and dot a small amount on the center of each biscuit, place a sage leaf, pressing lightly to affix to the top. Brush the biscuits with melted butter. Bake the biscuits until golden brown, 18-22 minutes. Let cool 15 minutes before serving. 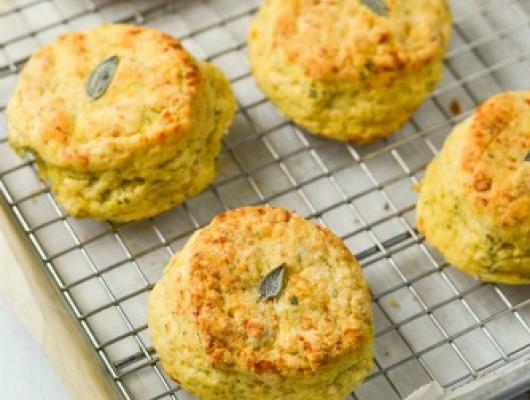 Tall and fluffy biscuits, full of sweet acorn squash, work perfectly with the flavors of herbal sage and nutty Gruyere cheese.